When this question is personalized, it becomes the most important question one will ever be asked or answer. Who is Jesus Christ to YOU? Jesus said, "I have come that they may have life, and that they may have it more abundantly" (John 10:10, NKJV). In 1 John 5:11-13 we are told that if we have the son in our life we can KNOW that we have eternal life. Jesus is the only way for us to live an abundant life here on earth, or receive eternal life in fellowship with God. 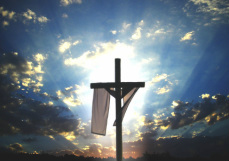 Jesus died on the cross to take the punishment for our sins so that we could be sinless in the eyes of God. If we do not receive the free gift of eternal life by experiencing the forgiveness achieved by Jesus, then we will receive the punishment we so justly deserve. Jesus must become the Lord of our lives. Imagine your life as an automobile—Jesus must be behind the wheel of your life. The verses below show the attributes of Jesus. But if he has not forgiven your sins, been invited into your life, and involved in a personal relationship with you, there is little purpose in reading on. You can change your life at this very moment. Admit your sin, repent of it before God. Believe in the atonement of Jesus on the cross and receive the gift of eternal life which Jesus died to freely give you. Invite Jesus into your life to live through you and thank him for doing so. Isaiah 9:6 -- For to us a child is born, to us a son is given, and the government will be on his shoulders. And he will be called Wonderful Counselor, Mighty God, Everlasting Father, and Prince of Peace. I John 3:5 -- But you know that he appeared so that he might take away our sins. And in him is no sin. Anyone can accept the freedom that Jesus' life, death and resurrection offers.